FAAC spa Via Benini 1 40069 Zola Predosa (BO) Tel. +39 051 61724 - Fax +39 051 758518 info@faac.it - www.faacgroup.com FAAC SUBSIDIARIES FAAC AG Tel. +41 52 3461721 Fax +41 52 3461723 Illnau, Switzerland www.faac.ch FAAC AUSTRALIA PTY LTD Tel. +61 2 7565644 Fax +61 2 87565677 Homebush – Sydney, Australia www.faac.com.au FAAC BENELUX Tel. +32 50 320202 Fax +32 50 32024215 Brugge, Belgium www.faac.be FAAC FRANCE Tel. +33 472218700 Fax +33 472218701 Corbas, France www.faac.fr FAAC NORD Tel. +33 1 69191620 Fax +33 1 69536069 Massy, France www.faac.fr FAAC GE.S. M.B.H. Tel. +43 662 8533950 Fax +43 662 85339520 Wals – Siezenheim, Austria www.faac.at FAAC GMBH Tel. +49 8654 49810 Fax +49 8654 498125 Freilassing, Germany www.faac.de FAAC INDIA PVT. LTD Tel. +91 120 3934100/4199 Fax +91 120 4212132 Noida – Delhi, India www.faacindia.com FAAC INTERNATIONAL INC. Tel. +1 307 6351991 Fax +1 307 6328148 Cheyenne, USA www.faacusa.com FAAC MIDDLE EAST Dubai, Emirati Arabi www.faac.ae info@faac.ae FAAC POLSKA SP.ZO.O. Tel. +48 22 8141125 Fax +48 22 8142024 Warszawa, Polska www.faac.pl FAAC SCANDINAVIA AB Tel. +46 36 376860 Fax +46 36 370780 Bankeryd, Sweden www.faac.se F.A.A.C. SA Tel. +34 91 6613112 Fax +34 91 6610050 Madrid, España www.faac.es F.A.A.C. SA Delegación Cataluña Tel. +34 93 4362000 Fax +34 93 5727994/4368225 Barcelona, España www.faac.es FAAC SHANGHAI Tel. 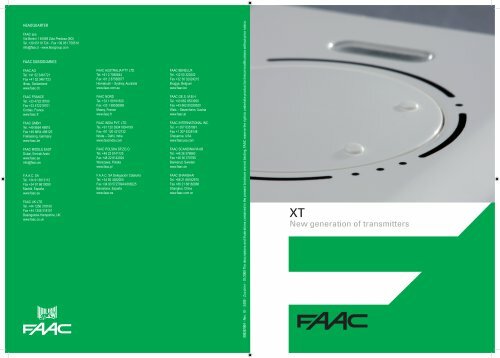 +86 21 68182970 Fax +86 21 68182968 Shanghai, China www.faac.com.cn FAAC UK LTD. Tel. +44 1256 318100 Fax +44 1256 318101 Basingstoke Hampshire, UK www.faac.co.uk 908387004 - Rev. 10 - 3.000 - Zucchini - 01/2009 The descriptions and illustrations contained in the present brochure are not binding. FAAC reserve the right to undertake product technical modifications without prior notice.